The crumbling structure, located at 175 Roger Avenue, has plagued the surrounding community for years. Inwood, NY - October 5, 2018 - Nassau County Executive Laura Curran today joined Nassau County Legislator Denise Ford, New York State Senator Todd Kaminsky, New York State Assemblywoman Missy Miller, Town of Hempstead Supervisor Laura Gillen and Town of Hempstead Councilman Bruce Blakeman to announce the demolition of a blighted county-owned building. The crumbling structure, located at 175 Roger Avenue in Inwood, has plagued the surrounding community for years. The former site of Rockaway Metal Products Inc., the now-dilapidated building has been abandoned for about 28 years. Over time, the roughly 85,000-square-foot site, which the county acquired in 1995, was fire-damaged and became an unsavory hangout. The United States Environmental Protection Agency declared the 66-year-old building a “Superfund Site” because of hazardous materials. The contractor, Watral Brothers, Inc., is a licensed professional under a $1.269-million contract for demolition and disposal. The total project cost is $1.649 million, which includes an additional $380,000 for construction management, contingency and environmental monitoring of the site. The contractor will begin along the south property line abutting the residences; first installing a protective mesh then demolishing the south wall by hand. All remaining demolition will be done with heavy equipment beginning on the north side and working towards the center of the property. Demolition debris will be removed continuously throughout the process. "Inwood is a vibrant, resilient community, and its residents deserve nothing less than a safe and clean neighborhood to live, work and play. Today's announcement is a seismic move toward beautifying Long Island, and I applaud County Executive Curran for spearheading this initiative and look forward to working collaboratively with our community partners to ensure the site goes to good use," said Kaminsky. 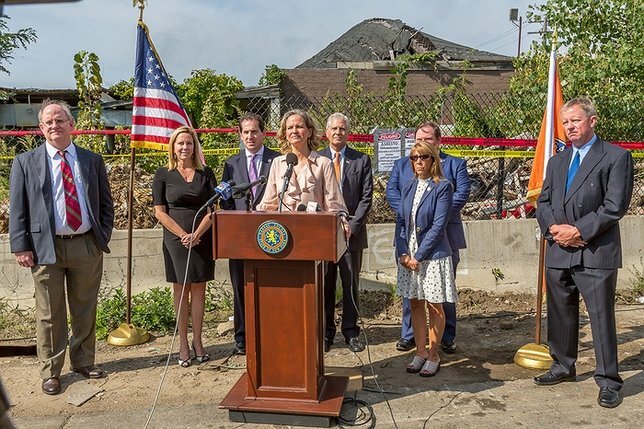 “I am glad that demolition and remediation of this property is finally starting, and hope this serves as the beginning of our community effort to improve blighted areas and encourage economic development in this gateway to Nassau County,” said Nassau County Legislator Carrie Solages. "Abandoned buildings like this are not only eyesores, but severely drive down property values. This is an important and long overdue step towards redevelopment and one that I’m pleased to take part in and witness. I'm pleased to join Nassau County Executive Laura Curran, and thank her for moving this project along, as well as for her continued support of the community," said Gillen. “The revitalization and development of the Inwood community is part of my vision for Nassau County’s economic growth,” said Curran. Subject: LongIsland.com - Your Name sent you Article details of "Nassau Executive Curran: Dilapidated Inwood Building to be Demolished"